You don't have to take a vacation in order to get away from the daily pressures of life. How about creating a peaceful oasis in your own backyard that you can visit anytime you want? A place to sit in a comfortable chair, close your eyes and listen to the sound of water. Quality family time: the sound of a water feature will draw people into your yard and provide a great backdrop for entertaining. Environmental Conservation: Water features attract wildlife of all kinds, from birds to butterflies, frogs and salamanders. How about adding a water feature to your outdoor living space? "We are really enjoying our new pond and are very happy with the quality of workmanship that you put into the final product. 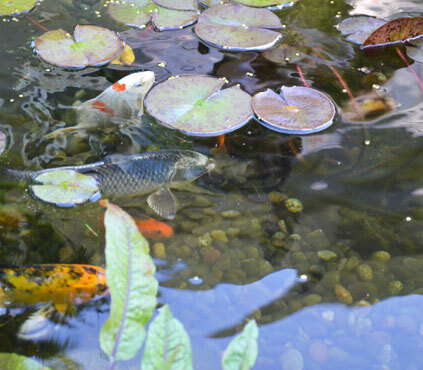 We sit out by the pond every day and enjoy the koi, frogs, salamander and snails that now call it home. It is the one place in our busy lives that we stop and relax and appreciate life... who would guess that watching water flowing in your pond would be so enjoyable." Ecosystem ponds come in all shapes and sizes. The components that create this functioning ecosystem are aeration, filtration (mechanical and biological), fish, aquatic plants, rocks and gravel. Rich Earth offers small, medium and large Ecosystem Pond Installation Packages to suit every space and budget. 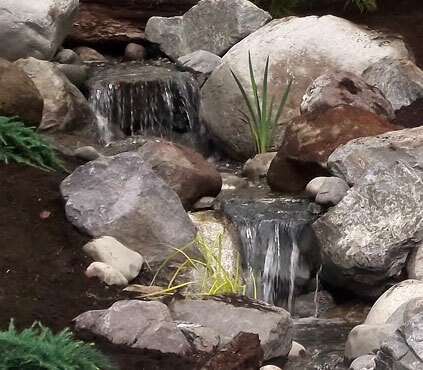 We also provide custom pond design and installation. 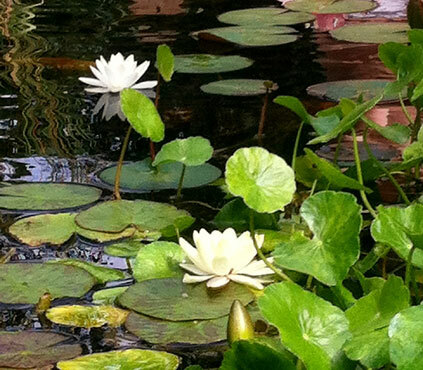 Does your pond require a pump replacement, filtration upgrades or a face lift? Rich Earth also offers repairs and renovation services for existing ponds. Contact us today for more info. Are you concerned about the safety and liabilities of a pond or are you apprehensive about the responsibility of maintaining an ecosystem pond? Then the Pondless waterfall is for you. It is basically a stream and waterfall, without the pond. 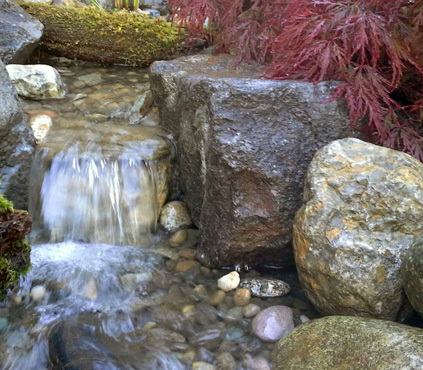 Pondless waterfalls are a great addition to any landscape. Small, decorative water features are a great way to 'get your feet wet' and add the sound of water to your outdoor space. Fountains attract birds of all kinds and are a great supply of water for them to drink and bathe in. A fountain can be easily added to your existing landscape. Plants, landscaping and water lighting can be added to make the feature more aesthetically pleasing. From basalt stone gurglers, to stacked slate urns, or carved stone mushrooms the list is really endless. Contact us today to add a waterscape to your yard!